It's official - we are 16 weeks from the Maine Marathon and I'm OFFICIALLY in training mode. Technically, I'm half-way there already as I'm just shy of 2 weeks from the KRRT 1/2 Marathon. 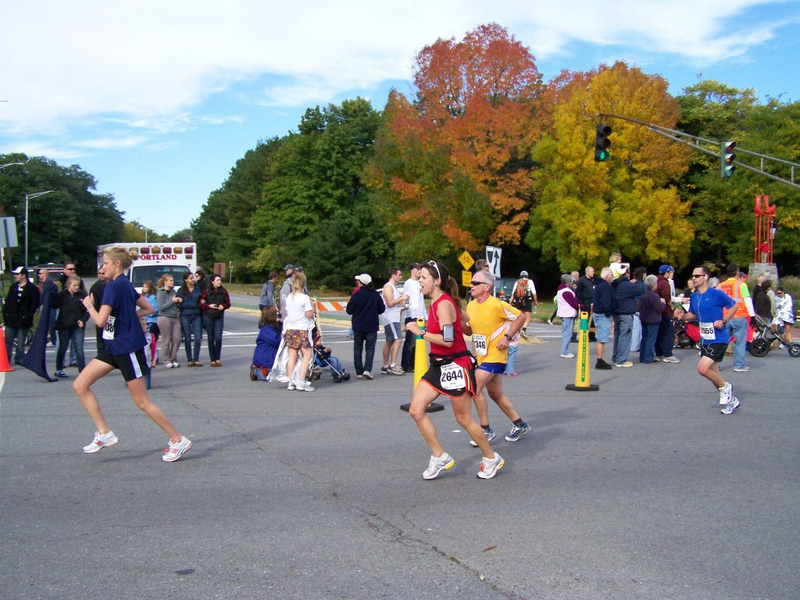 Here's a picture of me at the Maine (1/2) Marathon...I'll cross that finish line again! Only time as a 1st time Marathoner! Unfortunately, I've already altered the plan. Ward had soccer at 6 tonight, which meant he had to leave by 5, so that meant no run for me tonight and to do the Tuesday plan on Monday night. No biggie. My mileage is also going to be a bit off as well, as I've been averaging somewhere in the 28-31 miles/week range. There is always room for flexibility in every plan. Right? Happy Monday! Only 2.5 more student days! Oh and I should throw it out there, I'm noticing a sweet increase in my followers. When I hit 50 followers - there will be a giveaway. I'm not sure what yet! Almost there – Day 5! Day 4 - It's getting easier. I think.